That’s the message of Travis Ryan’s debut project Fearless on Integrity Records. The Saddleback Church worship Pastor collaborated with many other well known worship leaders for this debut, including Matt Redman, All Sons and Daughters, Brenton Brown, and Jason Ingram, to bring a project full of the love and power of God that casts out fear and torment. Right from the start, “Love That Has Won” is a powerful worship anthem that begins with strong guitars. The song itself isn’t as strong as its intro, but Travis’ deep vocals mix wonderfully with the powerful message of the love of God that has set us free. In parts, it has a sentiment similar to The City Harmonic, especially in the timeless pre-chorus. “Battle Song,” more contemporary, but with strong spurts of guitar throughout, is a call for the church to arise and defeat the powers of Satan: “Our hearts are beating like drums/ we join our voices and sing our battle song.” In this second track, Travis Ryan’s vocals sound particularly like Jason Roy from Building 429, so I’m sure that fans of Building 429’s will particularly enjoy this project, especially these opening tracks. With nice choirs and heavenly harmonies, “Most High” is a simple worship song, co-written by Jason Ingram, while “Jesus My Victory” speaks of communion, remembering the sacrifice Jesus made for us. With cellos and piano, this track is particularly soothing, but builds at the climax of thanksgiving. “Awaken Us” has a futurist feel, reminding me at once of Natalie Grant’s hit single “Your Great Name,” while the lyrics address needing the Lord to wake us up from our Spiritual slumber. The title track follows, soft but powerful, seeming to be a collection of Scripture verses on fear – most notably Psalm 23. It’s very cool, because while the album addresses the love of God, this track addresses God-given courage to face our fears. 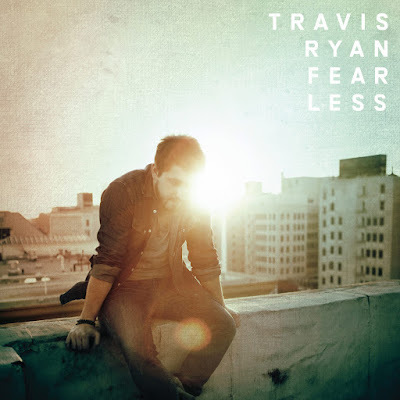 As 1 John 4:18 says, “Perfect love casts out fear,” and Travis Ryan’s Fearless album explores that topic thoroughly. This is a tremendous title track! “Devotion” follows, declaring that we can never stop singing God’s praises. I would have liked to see it a little more upbeat because of its lyrics, but the strong choirs at the beginning of each chorus are very enjoyable. The soft “You Are With Me Still” again brings out Psalm 23, reminding the listener that God will never leave us nor forsake us, and Fearless closes with “Chase,” co-written by Matt Redman. Soothing strings open the contemporary track, almost sounding like a Christmas song. The carefully-crafted lyrics accurately depict the times we run from God because we feel ashamed and dirty, but His furious love always chases after us: “Where Lord could we go, and where Lord, could we flee?/ Run a world away but we could not escape Your furious love.” The strings are breathtaking, still audible as guitars, piano, and booming drums come into the picture at the very end. Every track of Travis Ryan’s debut Integrity Records’ project Fearless speaks of the overwhelming love of God. Travis writes in such a way that it is impossible to listen to this project without considering God’s love in a way you have never considered it before. When we are ashamed of our failures, or even when we cannot help but have thanksgiving overflow in our hearts for His goodness toward us, His love is unfathomable, casting out all fear from the enemy. I highly recommend this project to fans of Building 429, particularly their last album Listen to the Sound. There are a handful of rock anthems (especially the opening tracks), but all are powerfully worshipful and no song is mundane. I will definitely be looking forward to a sophomore project from Travis Ryan.